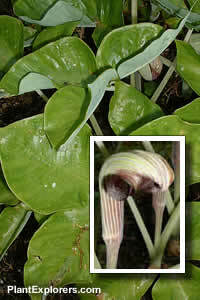 This tuberous perennial has glossy green leaves, each comprising 3 pointed leaflets and bears a hooded and curled, green and purple-striped spathe below its leaves in early summer. Flowers are followed by bright orange-red fruits. Height 12 inches. For maximum freshness, please keep seed refrigerated in its original packaging until it is time to plant. Sow seed in containers in a cold frame in fall or spring. Grow in moist but well-drained, neutral to acidic, humusy soil in a cool, partly shaded site.